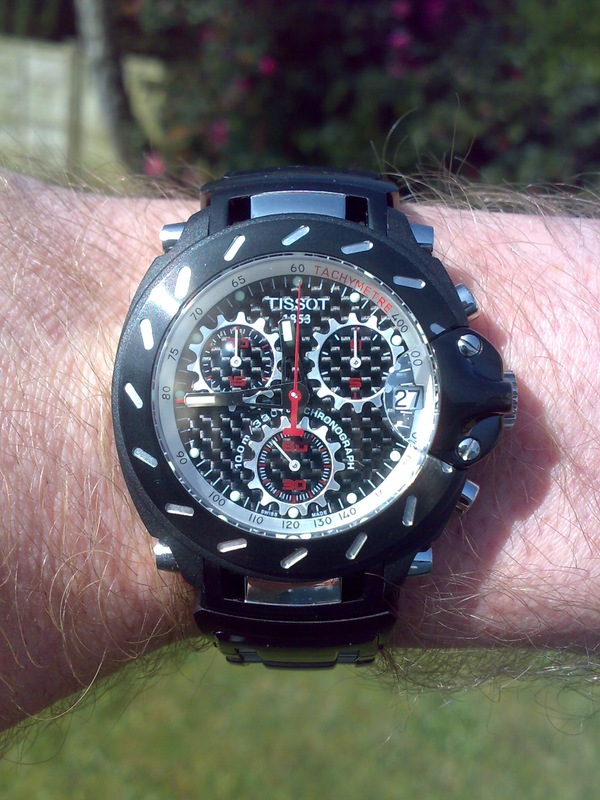 Rugged and functional, this Tissot T-Race gents' watch is the epitome of motorsport embodied in a wristwatch. Form, funtionality and famous Swiss accuracy. This is a beautifully engineered watch which looks as good as it keeps time. The design has a cool mechanical look which struck me the first time I saw it (in a shop window in Switzerland). This is combined with stylish subtle features like the mixture of silver and black in the strap and face. The quality is instantly recognisable and you can tell it was carefully constructed by people who know how to make fine watches (the Swiss are undoubtedly the world leaders when it comes to timepieces). Shortening the strap was a 2 minute job which I had done by a local jeweller. There is also finer adjustment possible via three notches on the clasp. This modification you can do yourself just with a pin. The timer is also easy to use and accurate to within 1/10 of a second. The tachymetre scale can be used to measure speeds if the object is moving over a distance of 1km (though you could apply it to other distances with some mental arithmetic or a calculator). Overall a fine watch and good service: well packaged and fast delivery with complete documentation and warranty certificate.